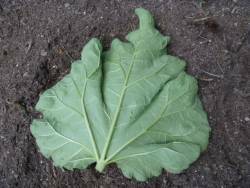 I wanted to make a formed rhubarb leaf in hypertufa - I've seen these used in a water feature, and so I've tried it here. I made up just a small amount of hypertufa mix, using sandblasting slag (instead of the usual sand) to make it stronger. 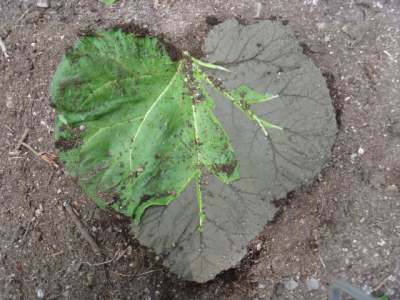 I chose the biggest rhubarb leaf I could find, and placed it upside down on a pile of soil in my garden. 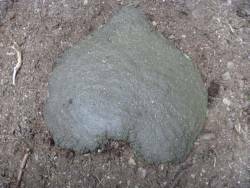 The soil was piled up so the leaf would be concave once it was finished. I globbed on a handful of the mix, and tried to keep it at about 3/4" thick (about 2-3cm) for more strength. I patted the mix all over in handfuls until the leaf was covered. I laid a piece of thin 2mil poly film over it, and weighed that down with a flat to prevent the film from blowing off. The next day, I took the covering off, and peeled the leaf off. 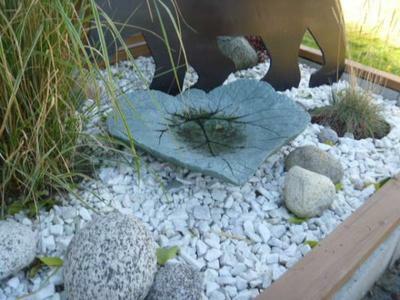 Once it ages and gets some moss on it, it will look so great.